I saw that photo and "heard" that song. It's a nice sentiment we could use more of. A girl's brain is often hard to turn off prior to sleep. It wants to make lists, To Do lists that never seem to end. Think I'll try adding you to my mental list of things that make me happy. I think I dislike the word ‘blessing’ because of its religious connotations. The instance that always comes to my mind is that of Esau and Jacob where Jacob disguises himself as his brother in order to get his father’s blessing and then when Isaac discovers he’s been duped instead of simply withdrawing his blessing he tells Jacob that’s it, no blessing for him. I never got that. It’s not as if a blessing’s a physical thing. He believed he was blessing Jacob so why wasn’t Jacob blessed? And what the hell did it matter anyway because it’s not as if the recipient suddenly got luckier or something. If I’m counting my blessing who exactly is that’s conferred his or her blessing on me? Yes, I know, it’s just a word but words matter. And here’s another one: how many times in his life must your average Catholic priest respond to the words, “Bless me Father…”? Thousands! Do blessings not count for anything nowadays? Being the negative sort of chap I am rather than counting blessings I usually try to imagine what I have to complain about. I suppose that comes from my mother who was always quick to remind me there was someone else worse off than me somewhere in the world. And I guess that’s mostly true but logic dictates there must be some bugger somewhere for whom nothing could get any worse and yet he too likely imagines there’s someone out there with a shittier life than his. Whatever gets him through the night. It’s true, there’re a lot of things in my life that could be shittier than they are right now. Most things could be better but I guess that’s true of most people too. 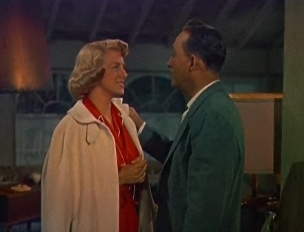 I’m sure I’ve see White Christmas at some time and yet I associate the song with the earlier film Holiday Inn which I know I’ve seen many times. My father was a huge Bing Crosby fan. He liked to think he could croon like him and he did his best but I’m sure he sounded better in his head although he could carry a tune; both my parents could. As an aside: the first song I sang my daughter (when she was minutes old and I got to hold her in my arms for the first time) was ‘Too-Ra-Loo-Ra-Loo-Ral (That's an Irish Lullaby)’ which I probably first heard Crosby sing in Going My Way; my ‘Bing’ wasn’t as good as my dad’s but I did my best. I bet yours was the finest rendition ever.